My grandfather lived well into his 90’s. Physically, he was in excellent shape ’til even the end. In his mid 80’s, he rode major roller coasters and The Power Tower with me at Cedar Point. He had the strength of a horse and plenty of endurance. But eventually, he succumbed to Alzheimer’s. 90% of your friends and family will probably chuckle at you, if you express health concerns about wireless phones or WiFi (which operates at a very similar frequency). Do cell phones cause cancer? They tell you absolutely not. But what they absolutely don’t understand is biology. If they did, they would respect the fact that most cancers are very slow to form. For example, brain tumors caused by radiation take an estimated 10 to 30 years to form. Sometimes even longer (1). Even with breast cancer, it’s not detectable for up to 8 years after the cancerous cell mutations first started (2). Despite that, naysayers will say you’re dumb to question their safety, because they’ve been using cell phones for 15 or 20 years now. Or using WiFi for 10 years. Speaking of which, that technology has only been around since 1997 (3). To be clear, officially the answer today is that neither cellular nor wifi causes cancer. 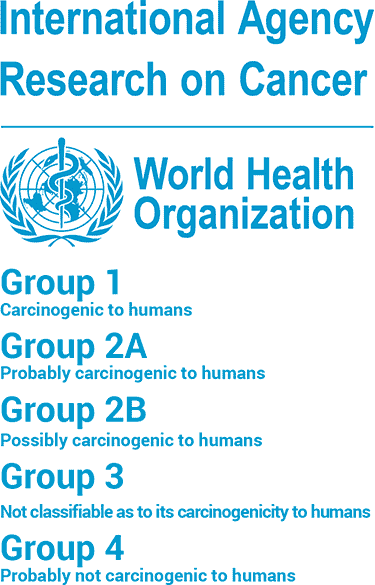 However, the World Health Organization has categorized radio frequency electromagnetic fields (which includes cell and WiFi) as being possibly “possibly carcinogenic” to humans, with a Group 2B rating. They slapped on that classification in 2011. 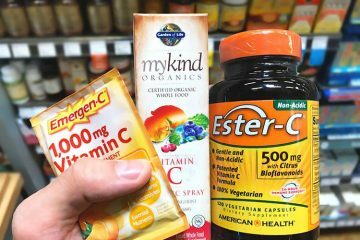 The growing body of evidence suggesting carcinogenicity meant concluding them to be safe was premature. They want to see more safety studies (4). Given the slow nature of cancers and the countless other risk factors in modern life, it will likely be a number of years until we conclusively know for sure whether cell phones are safe or not. Avoiding these wireless technologies altogether is not feasible and frankly, not desirable for most of us. They are more than a modern convenience, as many of us have occupations which require their constant use. Taking the pros and cons (unknown side effects) into consideration, perhaps the best approach is to simply minimize exposure. One of the easiest ways to do that is with a radiation blocking cell phone case. Do anti-radiation phone cases work? Yes and no. It depends on the model. 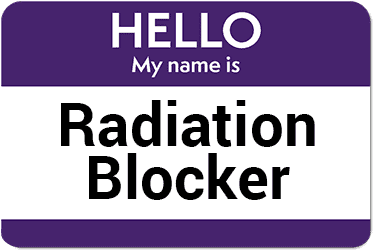 None will be effective at blocking 100% of the radiation, but some can greatly diminish that amount which comes in contact with your head or body. No, they don’t work in the sense that some models and products being sold are complete scams. While less common now, in the past on Ebay and Alibaba, you would see anti-radiation stickers for iPhone which seem quite dubious, from a technological and scientific perspective. So after reading that, do you still want those anti-radiation & battery salvage stickers for your cell phone? The so-called battery salvage feature is another questionable feature claimed by some sellers. They say it extends the rechargeable life of your battery by two or three fold. If it were that simple, then wouldn’t the OEMs like Apple and Samsung include them by default? While the actual word “sticker” is not found anywhere on that FTC page, the “shields” they describe seem to be the same thing. They’re small buttons and rectangles which you stick to the back of your phone. Now if these sticker shields were using RF blocking material which was enough to cover the entire front of your phone, then they definitely might work at blocking radiation when you hold the phone next to your ear and brain. But if you covered the front of your phone with an RF blocking sticker, then how would you ever see the screen! Bioexcel anti radiation stickers appear to have been on the market for over 5 years and claim to work by emitting negative ions, FIR, and scalar energy. 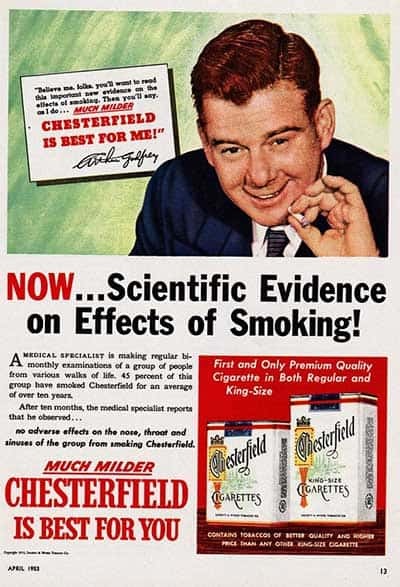 Some ads for them purport they block EMF radiation “by up to 99%” but we are unaware of published scientific studies to back such claims. 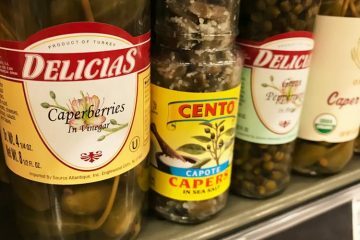 While customer reviews on retailer websites appear positive, that doesn’t necessarily correlate with product efficacy. If they ever publish verifiable studies, we will be happy to review them. A South Korean brand, Kpop, sell something called the EXO 24K gold anti-radiation mobile phone signature sticker. It costs just a buck, which makes you wonder not only if it works, but how much 24k gold can Kpop put in there at such a low price? Around the year 2000 or 2001, I had ordered anti-radiation stickers online. The instructions said to put them over the speaker slot. The ones I received didn’t work. I know because I tested them. That was over 15 years ago! It’s surprising to see stick-on shields are still running strong even today. Throughout the years since that initial sticker experiment, I have extensively researched and used a plethora of different radiation blocking phone cases. None are perfect, but several on the market really can help you. The following are what I believe to be the three best cases currently for sale. The word “best” is subjective in some regards, because for better performance you may be sacrificing something else, like functionality, ease of use, and aesthetics. 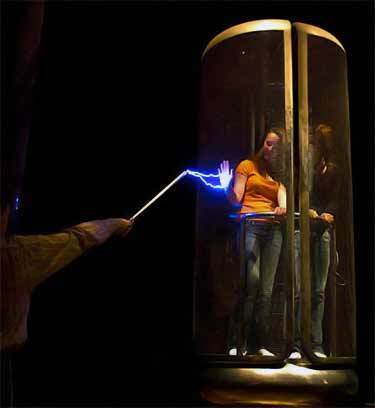 Technically, the most effective would be three mini Faraday cage models, as each would block 100% of mobile phone radiation. But those would not be a practical solution! That’s why the three I chose are diverse, each with their own pros and cons. Yet all will be better than a bare-boned iPhone or Samsung Galaxy in your pocket. This is the newest brand and also my favorite. I currently use it on my iPhone 7. It’s also available for the iPhone 8, 8 Plus, X, as well as the older models going back to the 5. It started out as a Kickstarter project, with the idea of creating the world’s first RFID blocking + anti-radiation case and wallet for iPhone. Unlike stickers, SafeSleeve has published test reports of how much radiation their case blocks. The tests were conducted by a FCC recognized and NVLAP accredited third-party independent lab (it was US Tech out of Georgia, if you’re curious). They didn’t include WiFi which is 2.4 GHz or the less common band used for it which is 5.2 GHz. However based on the 99% radiation reduction seen in neighboring frequencies, it would be a safe bet to make that it works well at WiFi blocking, too. As far as which of those match your device, that really depends on your carrier. AT&T, Verizon, Sprint, and T-Mobile all have different frequencies. To further complicate things, in one geographic region of the country they may use one frequency, while another is used elsewhere. It all depends on which FCC licenses they have the rights to in each region. The good news is you don’t have to worry about that, as the frequencies you see above have you covered, regardless of which carrier you happen to be on. Keep in mind though that radiation is still coming out of the open sides. If you blocked everything, then your phone wouldn’t have a signal. Performance aside, SafeSleeve is the winner when it comes to aesthetics. A flip case admittedly may not be the most fashionable accessory to have, but you need that if you want to block the majority of the radiation on both the front and back. Since it doubles up as a wallet, that drawback becomes acceptable. 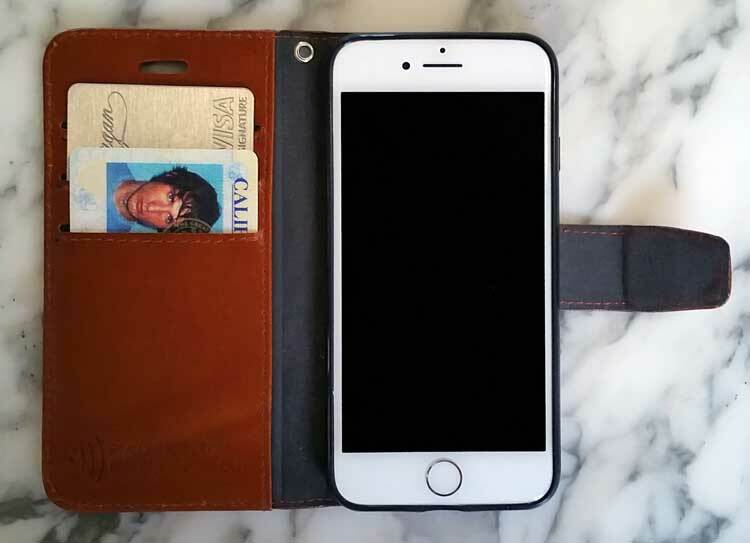 You can use it to store up to 3 cards of your choosing, whether that be a driver’s license, credit/debit cards, or any other type which fits in those standard size slots. If you want to use your phone for talking, then the idea is that you keep it flipped over the front of the screen – that way you’re blocking radiation on both the front and back. 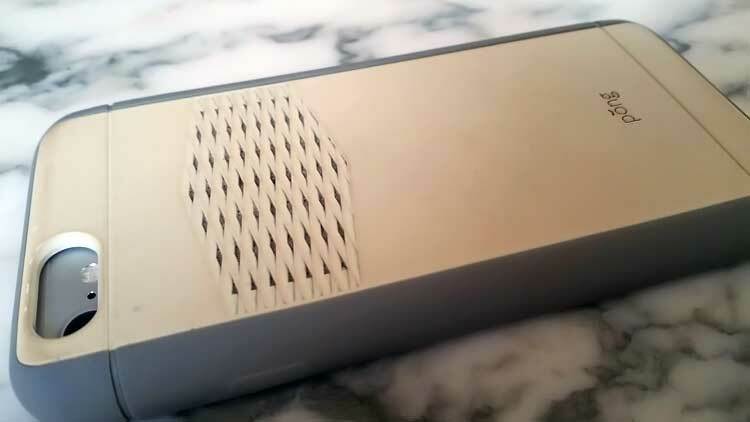 The speaker still works with the cover on, because there’s a small hole for that. The inevitable drawback of this is that you have to flip the cover open in order to access your keypad. You can turn it into a stand for watching Netflix, but my Safe Sleeve iPhone 7 case in leather isn’t very good at that. It stayed in position for the above photo, but it naturally wants to lay flat. Maybe it just needs to be broken in more? If you plan on using the stand a lot, it would probably be better to go with the non-leather models. As as I write this review, I could find it on Amazon for most models, including iPhone X, 7/8, 7/8 Plus, 6/6 Plus, and 5/5S. On there you can buy the SafeSleeve in leather (pictured) as well as other colors; black and grey. Pong was the name of this brand for several years and just two month ago, they changed the name to “alara case by BRINK CASE” (yes, written just like that). Since most people still know it by the old name, and the company still uses it on their website and social media, I’ll keep calling it Pong for now. How does Pong case work? By incorporating a gold-plated antenna in the back, it is able to redirect some of the radiation away from your body, assuming you have the screen facing your body. How much it reduces radiation though is not 99% like Safe Sleeve. The Pong website says it’s “up to” a 67% reduction when compared to a bare iPhone 8 or 8S. That’s according to the FCC certified lab they used for testing. Obviously, getting “up to” 2/3rds reduction is better than none at all. So if you refuse to use a model with a flip cover, then by all means the Pong will be the best anti-radiation cell phone case for your needs. Their technology is patented and there are no comparable or similar technologies on the market which do the same thing. This case you see pictured here was used for 2 years on an iPhone 6. 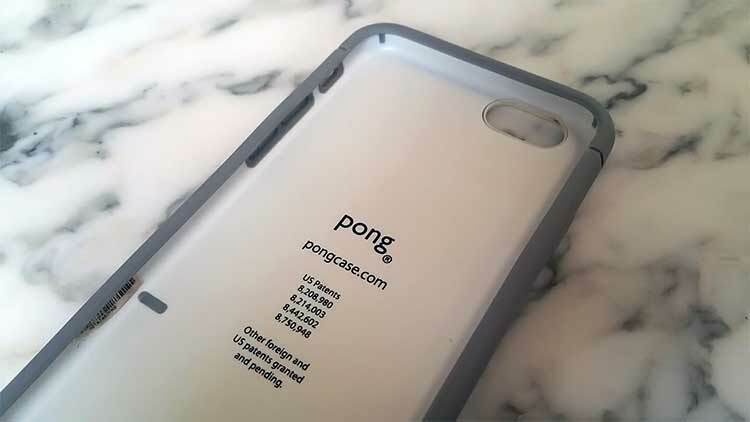 Before that, a similar Pong was used on my iPhone 5 model. The new ones for the iPhone X and Galaxy S8+ look almost identical, but their camera cutouts are a bit different. Aside from having only a 67% reduction, another drawback is that if you use it incorrectly, you may actually be increasing your radiation exposure. Now phones are pretty idiot-proof in the sense that you don’t see people walking around holding the back of the phone to their ear. Humans are dumb no doubt, but at least we all know that it’s the side with the screen which is designed to face our head when we make a call. But when it comes to storing a mobile phone in a pocket, which side faces outward versus inward is largely a preference. Think about it, if up to 67% of the radiation is coming out of the back and you put that back facing inward, your testicles or ovaries would then be getting up to 67% more radiation. In theory, at least. This is one of the reasons I had to have my mom stop using the Pong Case I got for her. She would not follow instructions on always ensuring the phone’s back faces away from her body. If I can’t even get my mom to follow instructions, will you be able to get your young kids to listen to you about this?! Another factor to consider is if more radiation is coming out of the case’s back, then what does that mean for our fingers and hands as we hold it to text or talk? Don’t worry, it does fit properly in the camera slot! That’s an iPhone 7, but in my old iPhone 6 case. All the grooves and crevices are magnets for dirt and grime, too. I would remove and wash it at least once a week. Despite any potential drawbacks about design, overall it’s better than not using a radiation cell phone case. But between Safe Sleeve vs. Pong, the latter is the 2nd choice in my book. So it doesn’t discolor like mine, get buy the iPhone 10 case or Galaxy S8+ case in black rather than white. Pong Research also makes cases for the iPad and its technology is arguably better suited for that. Why? Because serving as a stand to prop up your iPad or tablet, it means you don’t really need to hold it. That’s an ideal setup because higher amounts of radiation are going out the back, versus the front of the screen which you are touching with your fingers and palms. This product is very similar to Safe Sleeve. However this company, RF Safe Corporation, has been in business since 1998. You have to respect the fact that they were one of the first to be spreading the word on the potential harmful side effects of cell phones. They seem to also be research-oriented, which is obviously a good thing. The only reason I currently do not use RF Safe vs. SafeSleeve is because of aesthetics. That is the Achilles heel of this brand. This is what a used bronze case looks like (not mine). It’s not ugly per se, especially the black which is very neutral looking. But for visibility purposes, I prefer a white iPhone so I can see it in the dark. That means I also want a lighter-colored case to match. …and those options weren’t even available for every model. With the clasp on it, the bronze and white look like a woman’s wallet. A big fan of blue here, but their sky blue is something between an Easter Egg and a Tiffany jewelry box. Great colors for the girls, not so much for the guys. My review of RF Safe is admittedly one-sided being a male. If you’re a female, you might actually like their colors better than Safe Sleeve. But even with the black, I’m just not a fan of the material they use, given the $40 price point of the product. If it was cheaper, it would be understandable. But since that price isn’t far off from competitors, it’s not my first choice. Plus, you have to love the credit card slots on Safe Sleeve. You won’t get those with RF Safe. Now if the matchup was between a Pong vs. RF Safe cell phone case, even though I chose the former in the past, as of today I would choose RF Safe. Why? Well for starters, there’s even more troubling scientific data available today. The pre 2010 case-control human studies were not suggesting increased rates of gliomas (brain cancer), but those are being seen in some published 2010 and onward. A similar trend is seen with neuromas (slow growing non-cancerous nerve tumors). The National Toxicology Program’s 2 year rat study wasn’t around when I had an iPhone 5 (6). After NTP released preliminary results from that in 2016, it really makes you take notice. How much radiation a case blocks needs to be the deciding factor for me now, regardless of how good or not the case looks. As far as third-party testing by a FCC recognized lab, to the best of my knowledge RF Safe does not publish such a report on their website. What you will find though are over a dozen videos where they test in real time using industry standard tools like the Trifield XE100 and the Cornet Electrosmog meters. On a test with a Galaxy using the Cornet, you see the meter drop from 1800+ to as little as 1. Even without knowing the exact percentage for radiation reduction from an independent lab, the performance of an RF Safe is likely comparable to Safe Sleeve. The reason you can presume this is because these two companies are using well-known RF blocking technologies (not proprietary shielding like a Pong case uses). RF Safe uses polyester filaments which are woven with conductive threads. If you paid an electrical engineer to shield something for you, depending on the application, they would either use MuMetal or this type of mesh shielding. It’s not some new technology, so there’s no question of whether it works, because it does. Regardless, it would still be nice for them to publish third-party independent testing to reassure people of this. Speaking of testing, buying a meter yourself may not be a bad idea if you’re interested in reducing RF and EMF exposure throughout your home. I actually used this Trifield 100XE meter when house hunting, to check for those very things. Thanks Michael for the story and the detail to the various aspects of EMF shielding and frequencies. What if we have a reason to actually fully block the signal? How would we do this? There is some concern that my iphone was working even when turned off, as it would somehow use the battery over the coarse of a few months of being turned off. So long as it isn’t government mandated that we not interfere with their ability to find our phone when they want, I want to make sure they can’t. Yes they can argue only a terrorist would want that. But I’m no terrorist and I want that because like millions of Americans, I dislike the idea of Big Brother constantly keeping digital tabs on me. So how can I conveniently block the RF signal to the point even high-power bursts won’t be heard by the towers? Put your phone on Airplane Mode and it stops RF radiation. Keep in mind that you can’t make or receive calls when in this mode. I’ve used a Safesleeve case on my S6 but will be switching to an RF Safe case for my Samsung S9 as I just recently tested both cases and RF Safe was better. 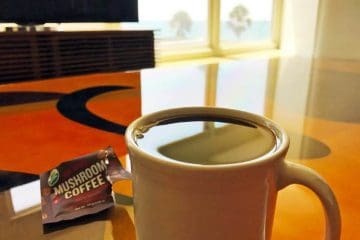 Hi Michael, for comparable effectiveness, anti-radiation patch/sticker is also a good choice. You can try them out. Hello Donna, RF Safe offers a 30 Day money back guarantee. All of RF Safe phone accessories come with a “Lifetime Discount Protection Plan”. If the case is damaged within the first year — a replacement case is always shipped to you free of charge. 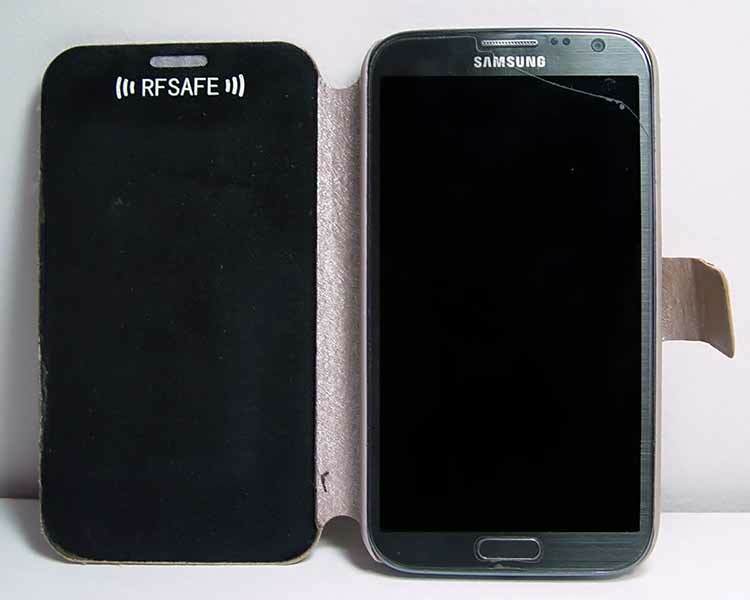 After the first year RF Safe offers a 50% off discount no matter how long the case was used. Even if your phone was lost or stolen, RF Safe never charges you full price for protection – Please see website for full details on all warranties — You’ll find that you’re even covered if you upgrade to a newer phone. Certainly you are never out 70 bucks! Just to note the most expensive phone case RF Safe sells is only 39.99. A package for it is sold for 70 bucks that includes a choice from seven different color air-tube headsets in two styles (mono or stereo) with a ferrite bead already installed on the headset wire. A 4th accessory is included as a reminder that radiation is only shielded from the front of the phone when case is closed. The plastic stand enables a user to tilt the phone so that the unshielded sides and rear of the phone aren’t “inline-of-sight” with the body. Cell phone radiation, just as light, travels in a straight line. Being informed and awareness of using a phone safely is the most important aspect of RF Safe’s system of safe cell phone usage with 4 accessories for 69.99. I hope anyone with a damaged RF safe accessory takes the time to call the phone number on the top of RF Safe’s website. The hard plastic cases in six colors with flip covers shielded by hand at RF safe are part of each cases product lifecycle – the case shown in review is a well-tested 1st gen case. 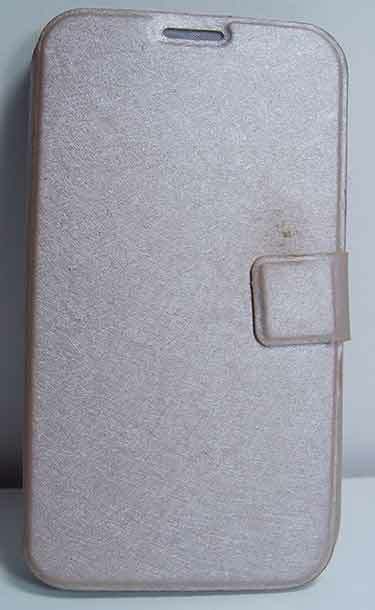 Hard plastic case with shielding applied by hand. The owner of a damaged case are always encouraged send it in for a replacement and when available a 2nd generation final production case is always sent. As demand increases for a particular color and model — silicon cases are made with RF Safe’s peel-n-shield embedded inside the flip cover. 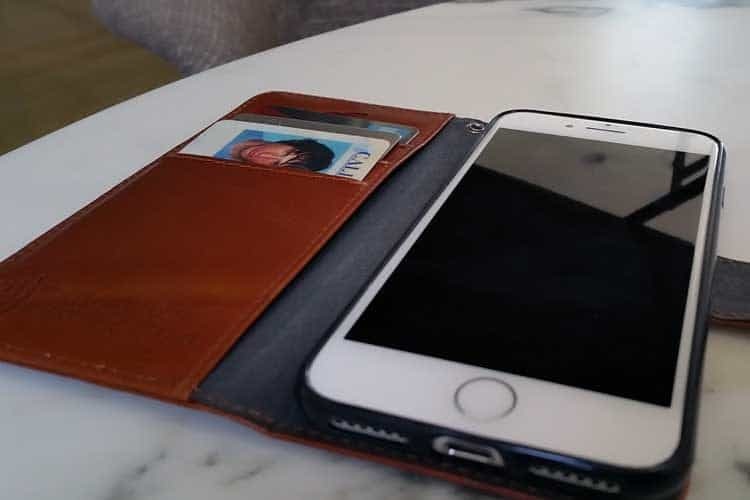 The 2nd Gen cover also includes room for a credit card but this is discouraged because excessive conductive RFID material that pushes the shielding at an angle from a phones surface can compromise shielding effectiveness. And this might be a silly question but are there any clear screen protectors with radiation reducing abilities? One more thing – would putting an anti-radiation sticker on back and using safe sleeve increase protection? SafeSleeve products are not tested by an FCC-approved lab. They have grossly mislead consumers. They only had tested one piece of material they claim is in their products. The consumer is given no proof that any of SafeSleeve products reduce any type of radiation. Do not bother testing their products with an RF meter because accurate testing requires a special lab that costs thousands of dollars. That’s why SafeSleeve has never had their products tested. 5) It could be a great selling point but read all above. OK, we need a bit more science here. Let’s start with some basics. Cell phones use radio frequency (RF emissions) to do what they do: transmit signals from one place to another. Block all RF emissions and the device does not work. Period. End of story. So, will someone please be a bit more scientific and specific with regard to what we’re trying to accomplish with these cases? Transmitters, including cell phones, emit radio signals on more than the assigned frequency. These other signals on other frequencies are “harmonics” and/or “noise” and/or “dirty” signals from less than optimal transmitters, antennae, and/or resonating frequencies emitted from metallic objects in close proximity to the transmitter, like the other components of the cell phone. Also, all electronic circuitry emits RF signals, not just transmitters. Cell phones are full of electronic circuitry. So, what types of RF are these cases intended to block? If they block the frequency being used by the phone than if the blocking is complete the phone won’t work. If it’s partial than, as noted by the FCC and related in the article, the phone may attempt to compensate for the weakened signal by increasing it’s signal strength, thereby emitting higher levels of radiation itself, and reducing battery life in the process. Perhaps more importantly, what types of radiation are causing, or likely to cause, or are suspected of causing, harm to humans? Is it the “harmonics” from the transmitter? Is it the RF from the circuitry? Is it the primary frequency on which the cell phone operates? This is important to understand. If the problem is the primary frequency on which the cell phone operates then forget the case and ditch the cell phone. This is a product review. Your questions are answered in our other piece: Do Cell Phones Cause Cancer? I emailed safesleeve and only the front cover blocks radiation. So you want to keep the front cover facing your body not the back of the phone. That’s why you shut the cover if you are talking on the phone. Hello! Thanks for this helpful review. I bought a Samsung Galaxy A5 a few years ago, since it appeared to have lower levels of radiation, etc. The issue I’m having is that none of these recommended cases will fit my phone. Do you know of any resources that might help me to find a case for my A5? Thank you again! Thank you very much for your text. I feel a lot of the radiation In my body and this cases are really helpful for me. No I both the Samsung S8 plus and I am trying to find out the best blocking radiation case or chip for it. So I would like to ask you please, did you ever try the chip? I would like to know which is better for me now (i use a LOT the screen of the phone with my HANDS to write messages and research on internet). In this case of using the hands on the screen, do you have any idea which one would protect me more, between the Safesleeve or something like the CellSafe CHIP??! I have an RFSafe case for my iphone 4S, which I have stopped using. It’s white with a red logo stamped on front — I would do the aesthetic design differently perhaps, but I was glad to have it for the protection. Now, I have just received a black safesleeve case for an iphone 7 plus. (The leather and grey models are out of stock.) It is much bulkier with two cards (credit & debit) and a FL driver’s license and about five bills of US cash folded in it. I would like a stronger magnet clasp. I would advise the company to stop production on the black case with white stitching – use black stitching instead, or some other dark complementary color. Overall, to my eye the case recalls a woman’s change purse (because of the iphone 7 plus’s length, partly). With three cards and cash in it, this case adds considerable bulk to the iphone 7 plus. With only the phone in it, the case closes fine with its magnetic clasp, and of course it’s lighter and less thick. My RFSafe’s clasp has an audible snap when it closes and is less bulky. The Safesleeve’s covers seem thicker than RFSafe’s, and I suppose they might be more protective against falls. Have you looked at the items at Less EMF? I found that their cell phone cases and other protection (a laptop shield) were great. Is there a reason why Vest Tech products were not included in your list? Are they not effective or is it just a matter of preference? Thanks for these reviews. Keep in mind that the reviewer receives affiliate commissions when the reader clicks on the recommended products, meaning he gets paid when you buy a product that he recommends. So there may be some bias here and there doesn’t seem to be any cited studies or evidence to back the claims. Just food for thought. Why didn’t you include DefenderShield? It looks really good too and they have independent FCC lab tests. Defender Shield is garbage. The readings stay the same for my phone whether it has their case on it or not! On top if that, their customer service is rude and defensive. I just tested Radi Armour’s case on my new I phone 7 and the phone radiates in the middle of the front with flap closed. I’m very disappointed and will return it. Seems like they only put fabric at the bottom 1/3rd of the case. I don’t understand why only the lab tests are accurate. I just purchases two SafeSleeve cases and tested them myself with the same meter they use on their website in the promotional video. I made sure there were no other electronics nearby and I had the meter at zero without the cell phone next to it. I did not get the results they show in the video. I tested the phone with and without the case and it did not make any difference. The meter was peaking no mater what, with the flap opened or closed. If the meter is picking up radiation through the case, then my head is too. SafeSleeve is willing to reimburse me for the cases, but I am concerned that this might be a case of false advertising. I bought a Safe Sleeve and it didn’t reduce the radiation reading on my meter at all. It’s the same meter in their commercial. SafeSleeve is garbage. And the customer service is even worse. I bought one in October 2017 and by the end of January 2018 the sticky patch had worn off to completely no longer be able to hold my phone. I contacted the company, and they would not replace it even though they recognized it was due to “normal wear” because they only have a 60 day warranty. And offered only a one-time 25% off coupon. for a $45 case only to be guaranteed for 2 months is absurd to me! I asked to be contacted by a manager as they do not have a phone number listed anywhere, just email address and has been a week and no response. Totally ignored. Also, after doing some research it seems only the front screen is protected and not the back, where most of the radiation comes from the back of the phone. I found a similar product on Amazon, slightly less expensive and offers 360 coverage against radiation, so I will be trying them out. Whereabout’s does the omitted radiation end up once it has been blocked by the sleeve? Like Kelvin, I had a negative experience with SafeSleeve. I had purchased an RF meter to measure radiation emitted when the phone during a call without the case and then with the case. The company’s customer service was defensive, alleging that my at-home test with an RF meter was not a true and reliable test and that only when conducted in a laboratory with a control would the test be considered valid. Well, either the sleeve blocks 99.9% of all emissions or it doesn’t. The point is, anything less than what the company is advertising constitutes FRAUD. If they had said a 50% reduction would be seen, then the RF meter should have reflected that. Methinks that this company is duping a lot of customers. 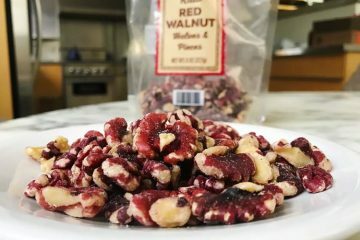 While the product ‘looks’ good, my experience was that it made NO difference at all. In fact, it was worse having this case and the notion of false security. 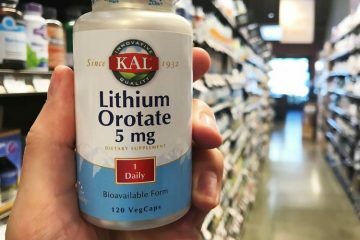 I ended up getting horrific migraines right after I started using it. I was falsely confident that I was being protected. Perhaps part of the case blocked the signal which forced the phone to work that much harder, therefore nullifying any benefit. Please note, consumers. I would not recommend SafeSleeve based on my experience. My concerns were brought up to the company’s customer service representatives. I was summarily dismissed. Same exact thing with DefenderShield. They got defensive when I called to question the readings I was getting on my meter, and then belittled my meter saying it was unreliable. Well, it was the same meter they were using in their website demos soooo….. I’m now thinking that all of these companies are a scam. If I didn’t have a meter I’d have never known and just kept using in blind faith! The front flap is the only part that has radiation protection. So if you put it facing the wrong direction in your pocket, you get all the radiation. We’ve used Defender Shield for a couple years now and I just found out that they have the same setup. The backside of the cover may deflect RFID scanning, but apparently not EMF radiation. It’s the front flap/cover that protects. So we all need to be aware of this when we use whatever product we purchase. Thanks for this article. I was searching for a better looking version of the Defender Shield and I am now seriously considering the SafeSleeve. At first I thought it was a negative that they only had the front shielding, but then I looked up my current product and found the same. It is what it is, I guess. I don’t see the value in the tablet cover if the shield only protects when the cover is closed. I’m only near the tablet when I’m using it. I bought a safe sleeve for my iPhone6 some years ago and was now looking into buying a new case as I am going to purchase a new phone soon. So I went to get the latest shielding updates and then came across this test conducted by Safe Sleeves competitors RF Safe: https://www.rfsafe.com/ftc-action-looms-over-safesleeve-case-misleads-consumers-years-exposed-california-news-channel-review/. This shows how the SafeSleeve doesn’t shield the waves (can’t tell if this was conducted the right way). There are also screenshots from SuperFoodly comments that I wasn’t able to locate on this site anymore. Based on my understanding, the rationale for a case to be selected as one of the best cases and to make it on this list is based on data that was provided by vendors. So, if SafeSleeve (as stated in the above article) has only FCC tested the shielding material and not the entire case, and the RFSafe the entire case, are we comparing the right data here? As a consumer, I definitely want to rely on tests made on the actual case and not only on the base material. In conclusion, I can say that I am confused. 1. Are above data based on actual phone cases tests conducted by an FCC approved lab? If yes, great. If not, I would expect an update on the above list. 2. Can I trust a test conducted by a competitor or is this is misleading as well? What do you think? 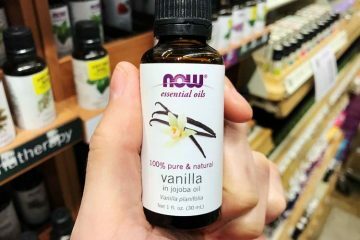 It would see great value if you as a trusted source can help us to shed some light on this so that we can be sure to purchase a product that is truly doing what its promises.